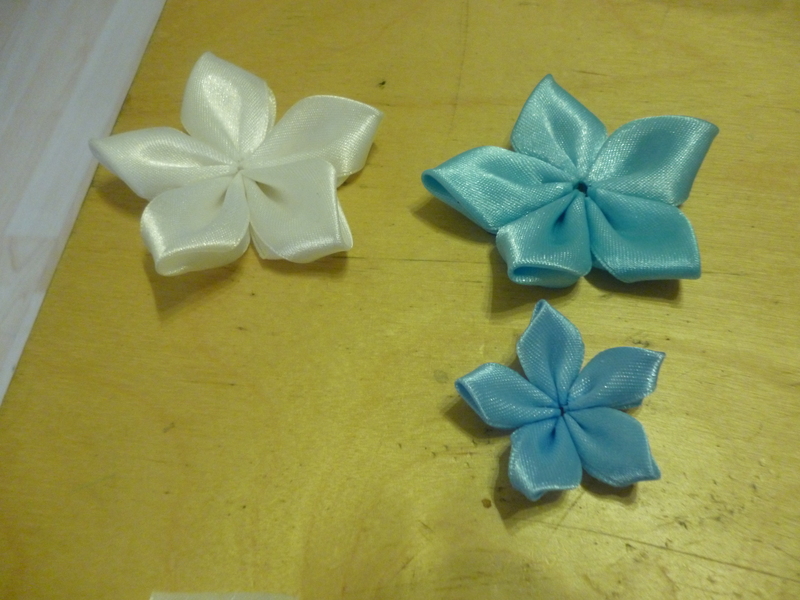 It’s a photo-tutorial about how to make a satin flower hairband. The instructions are quite simplified as you might expect, but I gave it a go myself last weekend. I started with the flowers first to get an idea of how to make them. 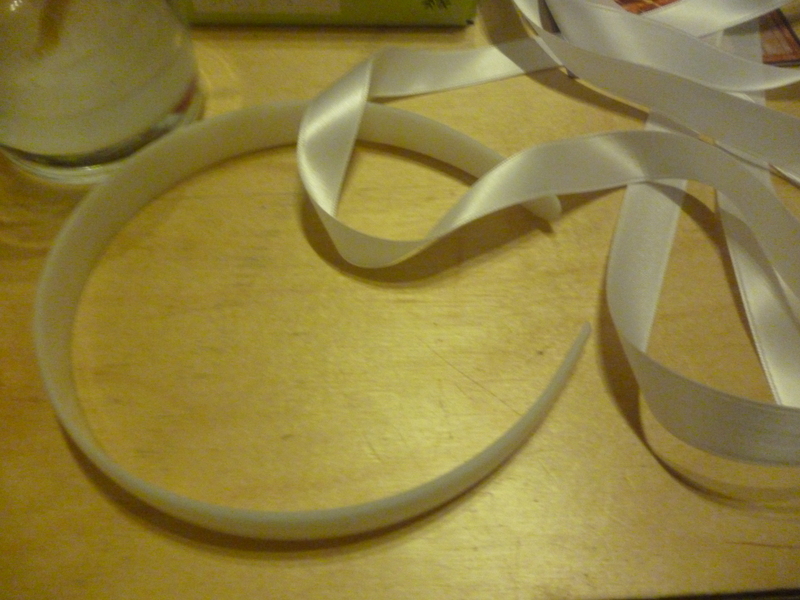 You need five individual pieces of cut ribbon, ideally with the ends sealed. The instructions are pretty clear in the given link, and it produces nice flowers. 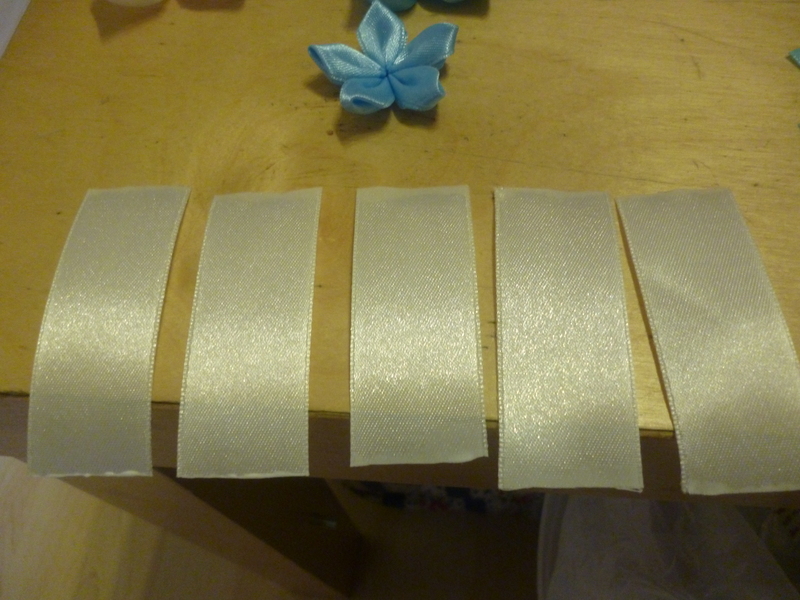 Try using different widths of ribbon! From this point onwards, you can stack the flowers and embellish them. I stacked them in order of size and contrasting colours, then used a pearl to decorate the centre. 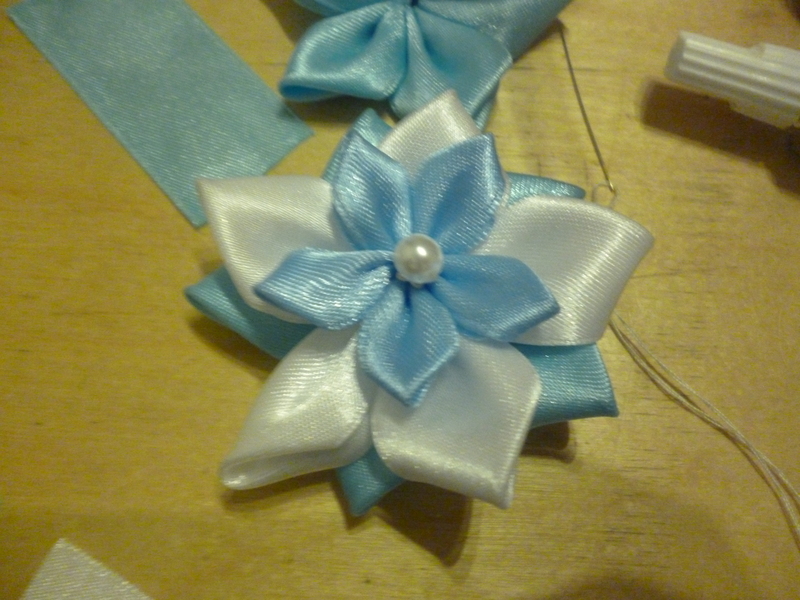 I also used a spare piece of ribbon to attach the flower stack to, to make it easier to attach to the hairband in the end. You can use superglue to glue the flowers together if the sewing doesn’t hold them together well. Next, you need a white hairband. I had the most trouble here! I couldn’t find a plain one. So I bought a plastic white one from the local market and two metres of satin ribbon, with the intention of wrapping it up. 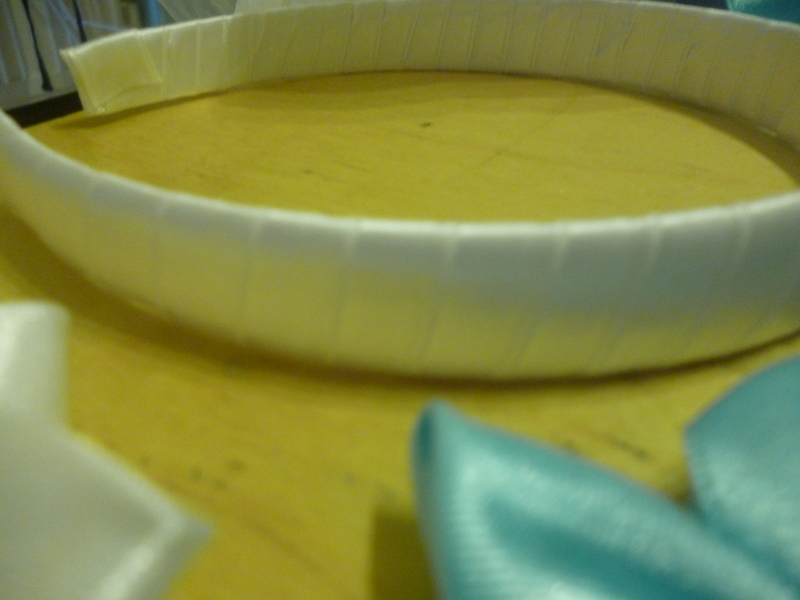 Some superglue is needed to hold the ends down, but after then, you just wrap the ribbon around the hairband. There are plenty of tutorials to help with this step, although the only tricky part is when you start and finish the ribbon wrapping. I suppose you don’t necessarily have to cover the plastic headband, but it makes it more comfortable to wear and looks prettier. The last task is to superglue the flowers to the hairband. For one of the flowers, I added a personal decorative flair by adding thin ribbon loops and lengths to make it hang off the hairband. I just generally like tassels! The final product is a completely handmade hairband that I know I will wear a lot. It’s great as well because it’s finally starting to be warmer around these parts, and works well with summer wear. 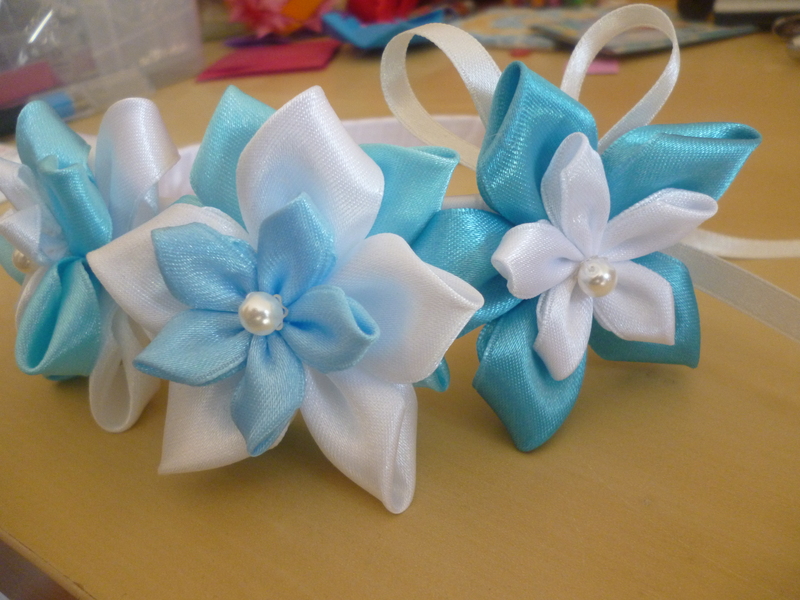 I might make more hairbands in the future! 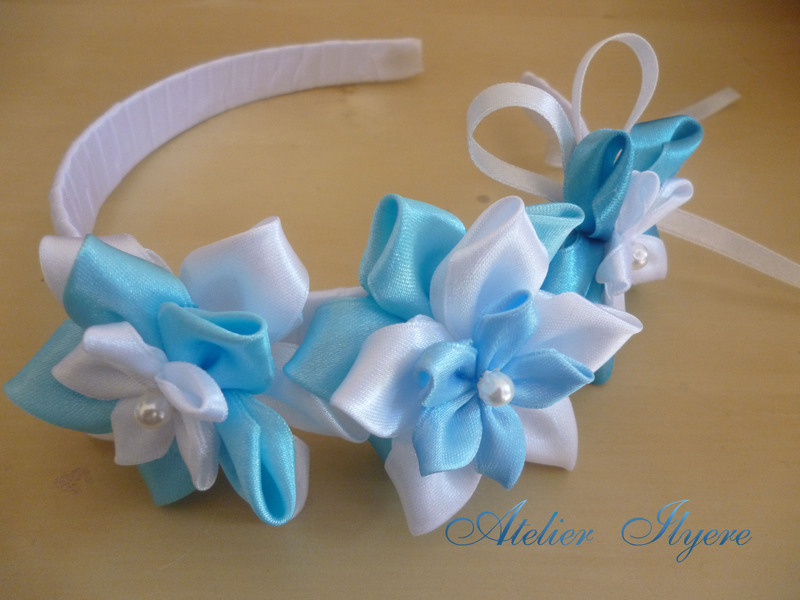 This entry was posted in Hair accessories, Jewellery, Pearls, Photo-tutorial, Process, Ribbon, Tutorial and tagged Blue, Flower, Hair accessory, Hairband, Ribbon, Satin, White. Bookmark the permalink.